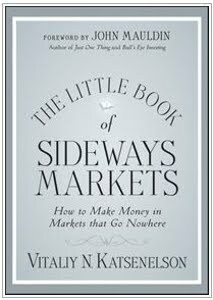 I just finished "The Little Book of Sideways Markets - How to Make Money in Markets That Go Nowhere," by Vitaliy Katsenelson. I liked this book. It was interesting, especially the historical overview of bull, bear, and sideways markets - both secular and cyclical. The book presents some value investing frameworks for selecting stocks during sideways markets and for holding them over much shorter time frames than traditional value investors would. It also contains a fair amount of the common guidance material in all books about investing. The part about P/E compression during sideways markets was new to me and interesting. This can even influence where to place long term positions during those periods.